Traders' preparation for volatile markets. We anticipated the current downward move, and while we might have expected some more significant upward retracements since June, 21st things are going mostly according to script. As expected in a third wave, continued selling pressure is now battering bulls into submission and will continue to do so for as long as they attempt to buy the dips. That’s what third waves need to do: convince people that what had worked before doesn’t work now. As more traders begin to pile into the short side, the risk to bears will no longer come from dip buyers but from short-covering rallies. We don’t expect that any such pops will alter the longer-term view, but they can develop quickly, move a long distance, and cause lots of pain to short-term positions. So while a nice bounce might be welcome as a milestone to benchmark wave progression, it would be unwelcome to traders with short-term traders unable to take the heat of a several hundred point run. Keep in mind, some of the biggest up moves can take place within bear markets. The overall point here is to be aware that relentless selling we’re experiencing should naturally lead to a short-covering rally at some point even if we cannot predict when. The trend has shown itself to be down and we should trade accordingly, but those trades also need to contemplate swift, surprise bounces. In the last hour of trading on Wednesday, the S&P 500 broke below the 1040 level that has been cited by pundits as critical supprt. This had served as support throughout the day and helped keep the market trading within a narrow range and when it let go, equities accellerated to the downside. Through three o’clock, volume on the day had remained at anemic levels, but picked up once the down move began. While total volume was still short of Tuesday’s performance, the message is that volume is on the downside, especially since we were able to put in a solid volume day when things just get moving in the last hour of trading. Wednesday also market the end of the quarter. Mark up games mustered little help for the markets and the Dow ended up down 96 points on the day. On Wednesday the Dow also fell beneath its June 8th low further reinforcing yesterday’s commentary: every day we see more evidence that we are in minor wave 3 down with little possibility for an alternate count that makes sense. However, we continue to struggle to put together a short-term count that we are confident in. As we can see from the down, it continues to stair-step downward finding both support and resistance at FibGrid levels. Because all the rallies into support are relatively shallow, we are hard pressed to identify meaningful retracements neccessary for counting waves as they progress downward. In this scenario, our technicals remain our best guide and are the primary input to the short term count. In order to use these guidelines we first need to set up the proper timeframe on our charts so that the entire five-wave move takes about 125 bars +/- 25 bars or so. In situations where one is comparing multiple possible counts that have significantly different duration it may be neccessary to use several different timeframes. It is also sometimes neccessary to try and predict how long a move will last to evaluate incomplete five-wave moves. 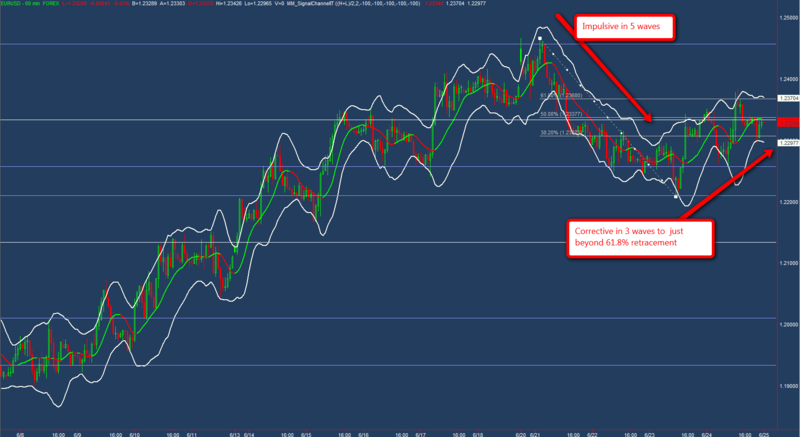 In this case, we have looked at several different timeframes, but will preset our count using a 15 minute chart. 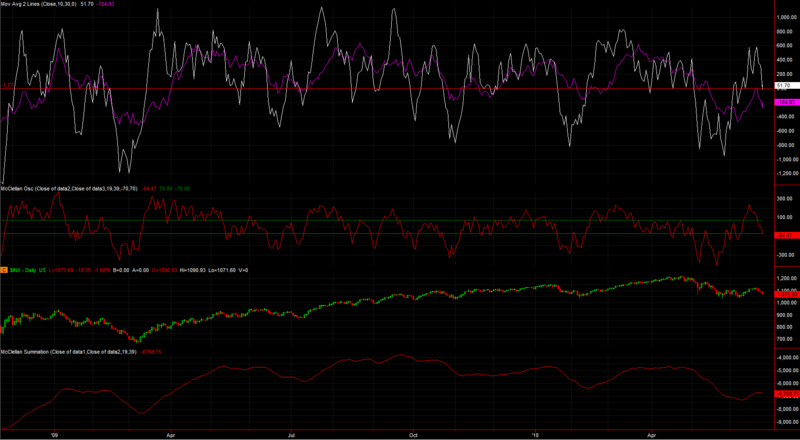 The RSI extreme helps us pinpoint  of iii. 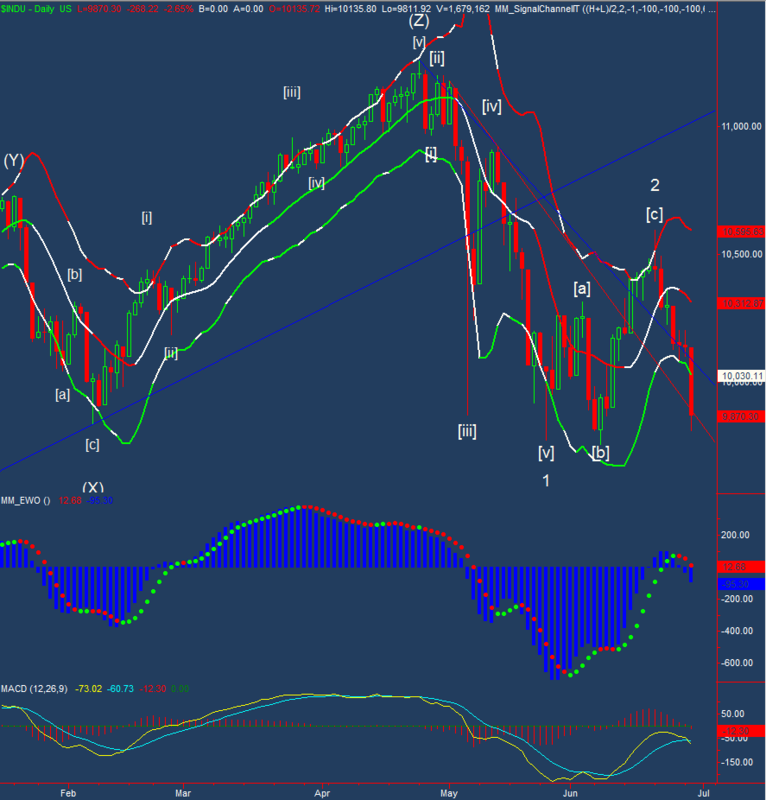 The large drop in EWO that occurred on June 29th in all timeframes indicates that it occurs in a third wave, so we need to be able to identify a completed five-wave structure prior to that drop. So knowing where  of iii is and knowing that wave (iii) has begun by June 29th gives us very limited locations to place the other waves that remain consistent with wave formation rules and guidelines. and the presented count is the result. Counting the subwaves that have been established so far within wave (iii) is more speculative, but we’ve made an attempt. Again we have aligned an RSI low with a third wave of a third wave, but the move may still be early in its development an premature to place labels. It is possible that wave i of (iii) ended on Wednesday, but this is not confirmed. The only reason to suspect it is the air kiss of the important 9,750 tree line level on FibGrid and the ability to count a completed five waves. But that doesn’t mean that the five wave move is complete. No change to the outlook. The trend is down. We are overdue for a retrace, and a several hunded point up move within the down trend could come at any time. Without a better short-term count we cannot predict when such a retrace might come. It could remain overdue for some time. It would take a move above June 21st highs to alter the outlook for continued lower prices. There’s plenty of overseas economic news out overnight and plenty of U.S. news out both before the market opens on Thursday and during market hours. Markets all but confirmed that we are in minute wave 3 today. This gives us confidence in an extended move down over the next couple of months, but the shorter-term count remains murky. Trading the longer-term trend may be the higher probability tactic until short-term clarity improves. By any measure, a 268 point drop in the Dow represents a change in character. A greater change was heralded by a return of volume to markets. The two together gives us the sharp down move we had been looking for to help identify a third wave. This doesn’t tell us which of the many short, shallow corrections we’ve seen since resuming downward moves on June 21st is a 2nd wave retracement. In fact, it’s still possible that we haven’t seen it yet. However, the negative strength of our technicals during Tuesday’s drop makes it most likely that we are now in a third wave down. Before we bemoan the lack of a good count that identifies wave [ii], let’s take a moment to observe the gift that the market gave us today: we all but ensured that the market has seen the end of minor wave 2. In the Dow prices have retraced over 93% of the move up from $9,758 on June 8th further decreasing the chance that it is just a correction. While we don’t currently follow the S&P 500 every day, we would be remiss if we didn’t cite that it broke to new lows down from its April high and managed to print its lowest close of 2010. Removing That provides confidence that the S&P is likely to be in Minute wave 3 along with the Dow. Merking this milestone allows us to consider 10,594 a likely lasting high on the Dow for some time to come. Taking it out would require us to re-work major portions of the wave count. Being able to count this as a durable high is much more valuable than knowing where we are within the smaller-degree wave structure. At this point we have a high degree of confidence that we are in minor wave 3 of intermediate wave (1) of primary wave . Unfortunately the price we pay for the added clarity in the minor wave count is murkiness in the wave count at minute degree and below. Our best analysis suggests that some or all of Tuesday’s decline occurred within minute wave 3. As we mentioned before, virtually all upward retracement in the past week has been short and shallow making it hard to discern wave structure. So our view of Tuesday’s action is based more on technicals than wave count. 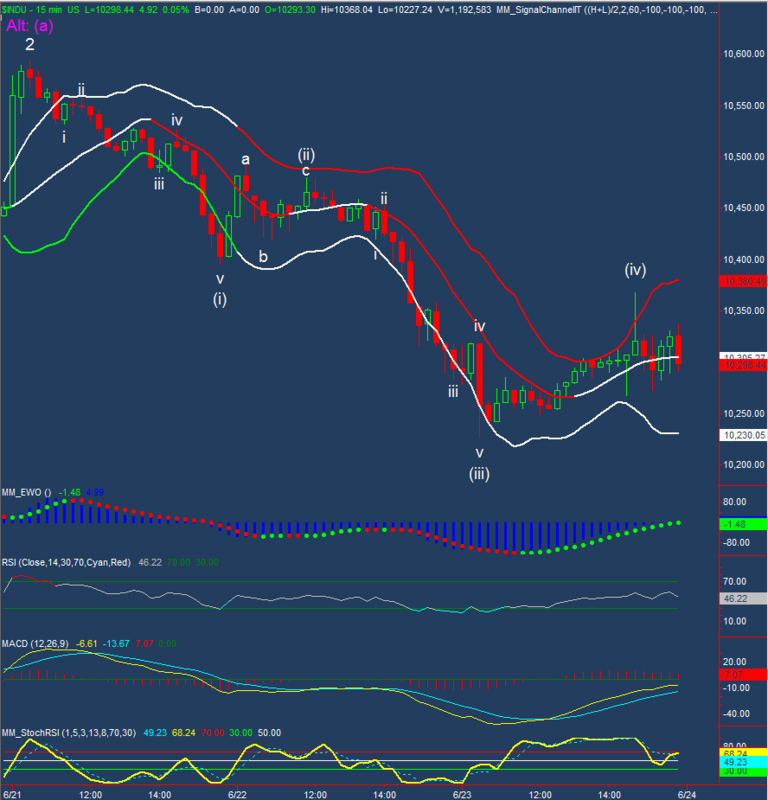 On all possibly relevant timeframes from less than a 5 minute chart to over a 60 minute chart, EWO and MACD recorded lower values during Tuesday’s decline than at any time since June 21st. Until a better view of the wave structure appears we will use that as our best guide and it suggests that we are most likely in minute wave [iii]. It would be unwise to trade on this assumption without further confirmation. Absent a reliable count or much reason to discern between them, we’ll focus on presenting a single primary without alternates. That doesn’t mean the count is right, it just means that we have high confidence in the higher degree count, hence showing only one. And with no confidence in the lower degree count, it doesn’t matter which wave we’re in at lower degree since we can’t act on it. If this wasn’t enough to signal the strength of the decline, we note that RSI(5) on the Dow reached its lowest level since Febrary, 2009. It’s worth pointing out that while many of these short-term strength measures tell us that markets are very weak, they might also be telling us that the move could be getting ahead of itself. Our lack of a confident count below minor degree makes it hard to predict exactly what will happen on Wednesday, but confidence in our larger degree count gives us a much better picture for longer term. There’s no reason to deviate with our expectation of seeing minor wave 3 take the Dow below 9,174 in the next few months with better targets around 8,800 and 8,300. This will make short-term trading based on Elliott Wave Theory difficulty because oversold bounces in a rapidly moving bear market can be large and rapid. The fact that drops may be faster and larger is little consolation if an unanticipated bounce wipes out a significant portion of equity and limits participation on drops. A prudent approach might be to adopt a longer term posture that anticpates the greater decline over the course of minor wave 3 and that could tolerate a bounce that retraces a significant portion of the move down from the end of minute wave 2. This might entail a longer timeframe and less leverage, but it is an attractive trace with what the market is telling us now. As always, it’s wise to plan for contingencies should our broader count also be wrong. This isn’t to suggest that one should completely avoid short-term trades. However, know the risks. If you have a way of getting out of trades quickly and with minimal losses, that’s great. But the short term wave counts may not be able to help in chossing entries and exits. Markets gave us little on Friday: little change and little clarity. What they did give us is more scenarios to consider and more questions. For Monday that leaves us waiting and watching for clues to the near-term direction. On Friday the Dow started the day by pushing to new lows at about the 61.8% retracement off the june lows before pressing back up into positive territory and then settling back to just below even for the close. The 61.8% retracement was an impetus for us to recognize the possibility for a completed move down which we published intraday. By counting out a double zig-zag, we can get to a complete move. Doing so has the benefit of count a triangle b wave within (w) so that this move that looked like a classic triangle could be counted as such. Nevertheless, the rate of decline since June 21st and the lack of significant wave overlap makes it is more likely to see this current move down as impulsive rather than a completed correction. So if it is corrective, it’s more likely to be incomplete. We’ll keep it on the list of potential counts as one that supports the possibility that we could go straight up from here. It won’t become a preferred candidate until we see price signal that up is more likely. 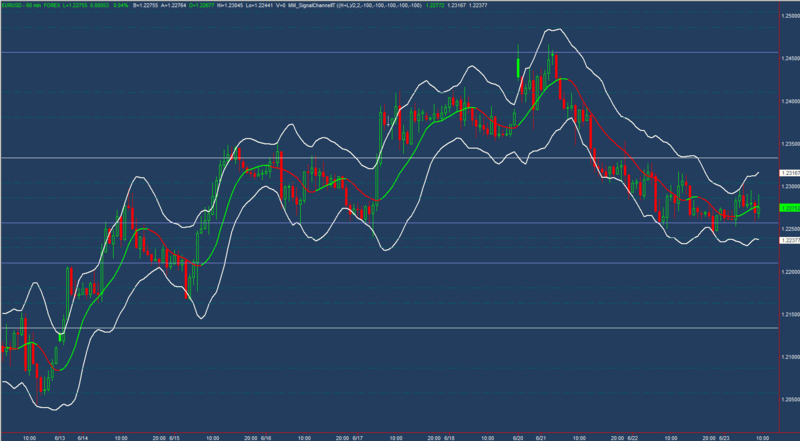 For our yellow count on the 15 minute chart we moved the location of (v) to Friday’s low. Technical indicators remain consistent with the possibility that this represents five waves down on the Dow. However they also are consistent with the end of five down on June 23rd. Lows on June 22nd stil are possible from a wave count perspective, but don’t agree with technicals. Further complicating the fifth wave into our yellow (v) counts out well as a 3-wave move, one which has already been sufficiently overlapped so that it cannot count well as a an impulse in progress. That has led to the introduction of a black alternate to suggest the possibility of a flat correction of five waves down into June 23rd lows. While this count remains possible, the move up from Friday’s low does not appear impulsive in a way that would support it as an unfolding (c) of a flat. To paraphrase Bob Precther, if the wave count isn’t clear, then the move probably isn’t over yet. What is clear is that we need to see more price action unfold to have a clear sense of where we are. We did suggest some guidelines for watching technicals to help us going into Friday’s session. Unfortunately, the market skirted falling into either scenario. 15-minete EWO did head up to test zero, but it did so after a an additional move down. The new low ruled out the possibility of a completed five-wave structure just before Thursday’s close. At the same time, the move down Fridasy morning wasn’t sufficient to indicate an impulsive beginning to a new leg down. Again, we’re in limbo. Sigh. We usually like to find something to hang our hat on that we can watch during the day session to guide us. Unfortunately, what we really need on Monday are some clues for direction. 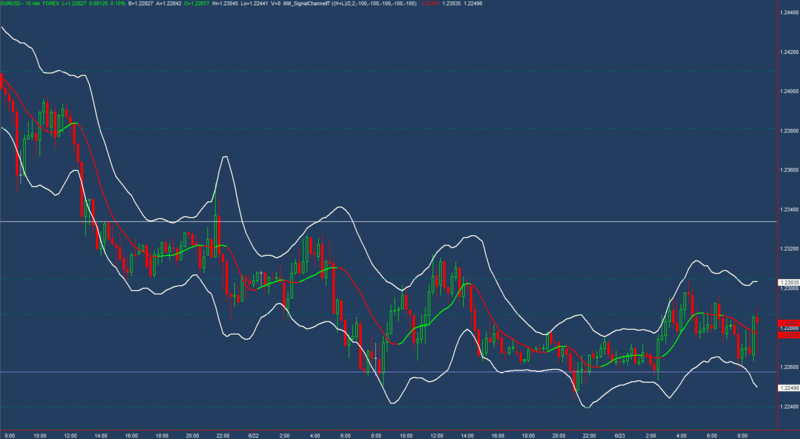 If anything emerges then we can try to get out an intraday update. In the meantime, any significant outlook remains elusive. To have some confidence in a direction, we need to markets pick a direction, not only by starting to move, but by having wave action that confirms it. Without the direction of impulsive and corrective moves confirming a count, it will be difficult to have any confidence in near-term direction. With prices pausing at the 61.8% retracement of the recent move up, we’re looking for any possibility to count a completed correction. The one that emerges is a possible double zig-zag shown in cyan on the chart. The Euro is testing snowline resistance. If it holds then we could see more downside for U.S. Equities. A quick turn lower in the Dow to take out the 6.18% retrace would keep new lows on the agenda. It’s nice when we can say that markets contiued to follow our expectations for so many days in a row. Hopefully the streak will continue. Weakness has been as persistent as strength was a week ago and it is making the more immediatly bearish counts that much more likely. Failure to put in some sort of bounce soon, even the three wave, corrective variety will all but rule out an incomplete wave [ii] and will likely leave us in a wave of continued selling. After seven straight days of higher closes into options expiration, we’ve now seen the first four trading days of this week with lower closes. We’ll cut the Dow some slack for it’s ever-so-slightly positive day on Wednesday because most broad indices closed down. This is definitely a market that is either hot or cold. Volume picked up slightly today as the dow shed 1.4% of its value and the advance-decline line posted -1688 for the day. We’ve been watching the McClellan Oscillator and Summation Index all week. First to note that the summation index was coming off a very high peak, then on Tuesday we noted it was already about to cross below zero and turn the Summation Index down. Wednesday’s close had it below zero and now on Thursday it’s already at -84.47 — below the -70 value typically thought of as oversold. More important is that it continues to drive the the Summation Index down as this is a better longer-term indicator of a change in market character. However, this does raise questions about whether we’re due for some flavor of oversold bounce; perhaps from end-of-quarter window dressing games. All of this is far less predictive than our Elliott Wave analysis, but it does help inform our view of the markets. As the Dow’s 200 day moving average continued to fade in the rear view mirror on Thursday, it also managed to slice through the 20 day SMA. If we continue to head down then the 20-day should curve downward on Friday and may help to keep a lid on prices. The 200 day average remains upward sloping; to change its direction will take roughly another 250 points downward, or time (a bit over a month if we stay where we are), or some combination of the two. I haven’t run the numbers rigorously, but I imagine that the 50 could cross the 200 in two weeks or less. Some analysts look for this so called “death cross” and should it happen we could see increased selling pressure. The Dow also took out the first of our two trendlines down from the April peak today. Our daily adaptive channel indicator has flatened out and appears ready to turn down on any additional weakness. These are both signs that we had been looking for to measure progress downward. On lower timeframes such as the hourly chart we continue to see prices breaking below the lower channel while being contained be the centerline on bounces. These demonstrate the strength of the move down andmake it more likely that the scenario we’re in has wave 2 complete as of Monday morning. Perhaps most important, is that the downward action has an impulsive look and feel to it. It retains all of the characteristics we mentioned in previous updates with respect to counting it through the early portion of wave (v). Wave (v) counts out well as a five-wave movement and ended near proportional targets that we cited. Giving us pause is the fact that the retracement that followed the morning lows, while distinctly corrective, was unusually shallow. It came in just shy of the 23.6% retracement. Nevertheless, we have called it [ii] on the white count. We have allowed for an alternate yellow count that has (v) ending at the afternoon lows, or slightly lower on Friday. This yellow count doesn’t have as clean a look and technical indicators such as RSI and EWO do not have the right look on a 2 minute chart looking just at the potential yellow wave (v). However, it’s still worth considering this case because it is one in which wave [ii] is yet to occur and will help us to be on guard for any up move that might be observed. With that in mind, but our white count and the magenta alternate show a completed second wave of some degree. Both of these counts would suggest more downside on Friday. The yellow count would suggest more downside after a retrace for wave [ii]. The green alternate count is to remind us that any of the completed five-wave structures could be the A wave of a zig-zag correction. However, this possibility continues to lose credibility daily as upward corrections continue to be short, choppy affairs. Nothing liiks much like a (b) of [b]. We often spend much of our energy looking at the Dow. However, other indices can often provide valuable clues. The S&P 500 counts similar to the Dow, but has now retraced more than 61.8% of its recent move up. That leaves it with little wiggle room to be in a zig-zag as it, too, doesn’t have a retrace worthy of a (b) of [b]. If it doesn’t put one in soon then it will be difficult to find a count that sees much upside. I’m not going to put in a full count of the Euro tonight, but I will point its move down from Monday afternoon is impulsive followed by a corrective retracement. It continues to obey levels from our FibGrid long-term projections and is finding resistance at the snowline. Failure there will likely lead to a further fall and should weigh on U.S. equities. 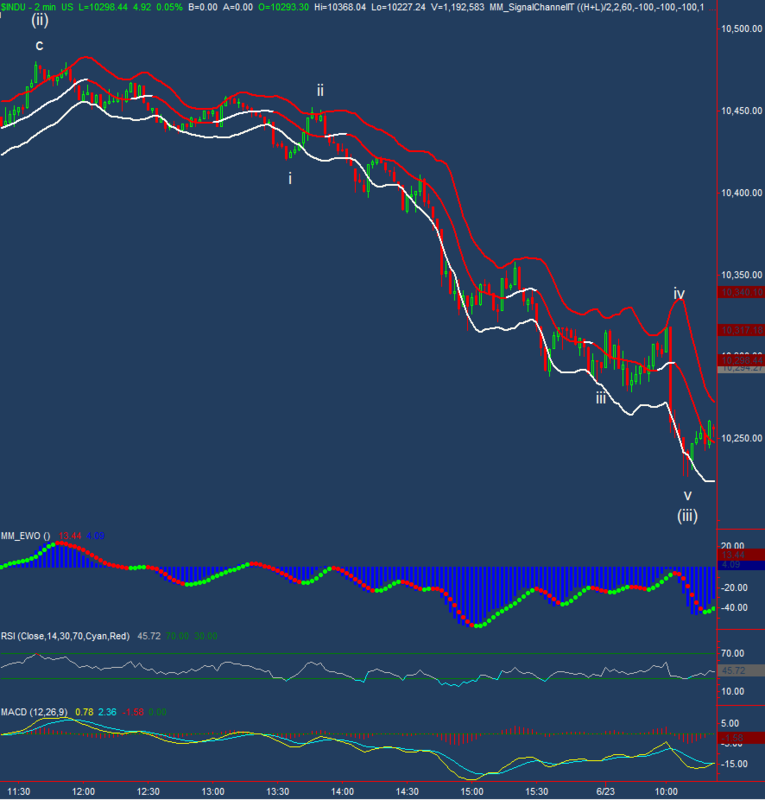 EWO turns upward on a 10 minute or 15 minute chart to reach zero, or near it. We would expect EWO to turn up at the end of either a third wave or a fifth wave. A third wave should make itself obvious by the time it is complete. So any signal by our technical indicators of a completed move prior to showing a clear third wave would most likely mean that the white and magenta counts are prematurely bearish. That’s rather sketchy guidance, but from an Elliott Wave perspective, there’s little else to offer guidance as things are pretty straightforward even if the count isn’t certain. If the next move of 1% or 2% is down and not up then more than 2% should follow quickly. The upside does not have such odds on its side, an up move may open the door to more upside, but it doesn’t neccessarily make it likely. Any surprises will likely be to the downside. Tomorrow morning before the open we have final revisions to Q1 GDP. At 9:55 we have University of Michigan Consumer Sentiment numbers. Markets continue to move consistent with our expectation (in itself, that’s inconsistent with recent experience). So our primary tasks this evening are just to review the current wave count and see if we can anticipate targets. One change this evening is that the update is here on the blog instead of a linked PDF document. If it works well we may make the change permanent. After making fresh lows beneath Monday’s pivot high on Wednesday morning, the Dow popped following the release of FOMC comments before settling back down to nearly unchanged. Breadth slightly negative. Other broad indices were down slightly. Volume remained very light. Our preferred count for the move down from Monday’s peak remains the one we presented briefly in Tuesday’s update and Wednesday’s action continues to support this as our primary candidate. The count is shown on a 15 minute chart in order to observe several technical indicators; if this is a five wave structure then it will probably last through the week, making a 15 minute chart the correct time period to use our technicals to inform our wave counts. From this persepective, RSI made its lowest low at wave iii of (iii) as we would expect. Both the Elliott Wave Oscillator and MACD were lower during wave (iii) than durin wave (i). Wave (ii) saw a flattening of our adaptive channel, but it did not bend up and price did not break above the upper channel. These are all consistent with classical observations seen in impulse waves. However, the structure is not perfect. or candate for wave (ii) looks somewhat unorthodox the the end of c terminating prior to the end of a. Nevertheless, it doesn’t break any rules of wave formation. Drilling down to a a 2 minute chart lets us look at the technicals for wave (iii) as a completed five wave decline and verify that it has all of the attributes mentioned above. It also shows the Elliott Wave Oscillato retracing between 90% and 140% of its wave iii nadir in wave iv and MACD, EWO, and RSI all made higher lows in wave v. Being able to identify all of our candidate for wave (iii) as a well formed impulse further supports our view of the entire structure. With many of these observations intact from Tuesday, Wednesday’s move to new lows counted out well as v of (iii) and led to an expected retracement for wave (iv) of [i]. We have tentatively assigned this label to Wednesday’s high, but it is tentative. There is nothing that counts out easily in move off the lows. However, the movement is very choppy with significant overlap just about anyplace we look; that favors viewing the move as corrective in nature. However, even if it is corrective, it doesn’t need to be complete. We still consider the possibility that Tuesday’s high was wave [a] of a zig-zag correction. However, if this scenario was playing out we would expect to see the current move down extend downward to complete 5 waves down for (i) of [b]. Nothing yet rules out this possibility even though it would likely lead to a very deeply retracing [b] wave. The current move down does not appear to be a completed [b] wave because there are no divergences at Wednesday’s lows. However, we should be on the look out for other possible corrective patterns. If Wednesday’s low ends three identifiable waves down it could be [b], the first leg of a triangle [b], or a of [b] that unfolds as a flat correction among other possibilities. Despite these options, for now we’re looking for five waves down. If that’s what we get, the next task will be to determine whether it begins an motive wave or a corrective one. Other broad indices look slightly different. They’ve managed to retrace slightly deeper and have RSI lows nearer the point we’re calling wave (iii). However, they none show divergences at Wednesday’s low. As markets continue to move in line with our expectations, there is little to add to our expectations. The one item we have to add is that EWO reached its wave (iii) extreme at -125.98 on our 15 minute chart. Since then, the highest value recorded was 6.02, well within expectations for a wave (iv). Should the Dow continue to strengthen and pull EWO up beyond a 140% retracement of the low to over 50.4, that would be a signal that some other structure was unfolding. Should we see that happen, the first thing to look for would be to see if wave structure was consistent with counting Wednesday’s low as [b] of 2. 10,189 is 17 127% external retracement of (iv) should it be complete. 10, 184 is a fireline in our long-term Fibonacci projection — this is one of the most significant levels there is, representing the 1.618 projection of the primary wave  that began in 2002. At 10,140 (v) would be 0.618 x the total distance travelled in waves (i) through (iii) and 1.618 x the length of (iv). 10,000 is not out of the question. It’s curious that this would represent 1.618 x the total distance travelled in waves (i) through (iii) and 2.618 x the length of (iv). However, reaching that level in a wave (v) would be a significant move and would have odd proportions. A more reasonable way to reach 10,000 would be if five waves down ended in our target region as wave (a) of [b]. From there, a (b) that retraced 61.8% of (a) followed by a (c) = (a) woulde end up at the same 10,000 level. So if wave 2 is not yet complete, 10,000 is as good a target as any for and end to [c] of 2. If, however, the current move down represents the first small waves down in wave 3 then we still would look for a retrace. Either way, we expect five down to be followed by a subsequent five down after the retrace. But from there we’ll need to be on our toes to try and discern whether the whole structure is motive or corrective. That’s likely a discussion for next week, and only if things unfold as we currently expect. It seems that the favorite parlor game among Elliott Wave currency watchers is trying to figure out which wave has extended in the Euro’s dramatic drop and/or the U.S. Dollar’s dramatic rise. What fun! Even though the Euro found support at the light violet “skyline” at 1.2258 when it tested the level around 8:00 EDT on Tuesday, the modest bounce did nothing to prop up U.S. equity markets during the day. These levels produced from subdivisions of long-term Fibonacci projections continue to provide an excellent way to mark the progress of the Euro, or just about anything else we watch. Since the test on Tuesday morning, there have been two more attempts by the Euro to crack the Skyline and it is beginning to give the appearance of an inverted head and shoulder pattern at that level suggesting that perhaps the level might hold. Stepping back to look at these levels on a 60 minute chart we can see how price is stair-stepping its way between bands created by our projections. So the real question posed by the support at the Skyline at 1.2258 is whether it is sufficient to help get the Euro back over the Snowline at 1.2334. Failure there would imply that the skyline will break and we will likely fall back down to 1.2134 in relatively short order. For now, it looks like the Euro wants to make another attempt to get through the skyline. It’s what I’ll be watching today. Daily Update: Dr. Evil’s Trading Plan Worked? Monday’s high appears to mark the end of five waves up from June 8th. If so, then we expect continued downside to at least retrace a portion of the move up, if not an immediate return to new lows. Analysis and projections are in The Deviant Standard for June 22 (PDF).